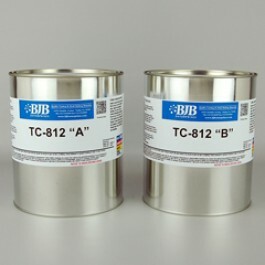 TC-812 A/B is a light weight filled, low viscosity, quick setting, easy to use casting material. A model or tool cast from TC-812 A/B will weigh 40% less than other unfilled urethane systems. Within 60 minutes after mixing and pouring, it is ready to be carved, sanded, filed, tapped, etc. Its characteristics make it ideal for lightweight backing of laminates and/or surface coats. Perfect for fast take offs, cores, engineering changes, temporary molds, patterns, models, prototypes, and bases for die molds.